Clara Barton nominated Mrs. Mott for the American Women’s Hall of Fame in 1910. 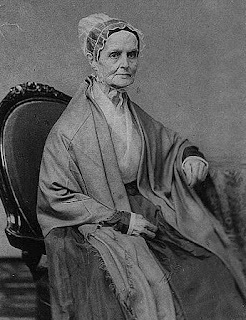 Mrs. Mott also hailed from Massachusetts, born in 1793 and lived to be 87 years old. A Quaker, she attended Nine Partners Quaker Boarding School in a community now called Millbrook, New York. After graduation she remained at the school as a teacher. She married colleague James Mott in 1811 and together they had six children, all but one grew up to be active social reformers. The family resided in Philadelphia, where Mrs. Mott became a Quaker minister and influential speaker. She and her husband helped form several abolitionist societies in the late 1830s, making them targets of anti-abolitionist mobs. Mott met Elizabeth Cady Stanton in London, England while attending the World’s Anti-Slavery Convention in June 1840. Frustrated by their inability to vote, together they held the first Women’s Rights Convention in Seneca Falls, NY in 1848. To promote abolition in the 1840s, Mott spent time lecturing all over the country including the South. In Washington D. C., 40 Congressmen attended Mott’s lecture, made to coincide with their return from Christmas recess. After her speech President John Tyler commented to her that he, “would like to hand [pro-slavery Senator]…Calhoun over to you.” Although a prolific speaker, Mott rarely wrote down her speeches. She did publish two, A Sermon To Medical Students in 1849 andDiscourse on Woman in 1850. In 1864, Mott and a group of Hicksite Quakers founded Swarthmore College in suburban Philadelphia which is still a leading American liberal-arts institution. In 1866, she joined forces with E.C. 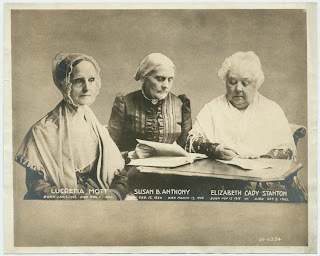 Stanton, Susan B. Anthony and Lucy Stone Blackwell to establish the American Equal Rights Association. Elected the Association’s first president, the group leadership disagreed about priorities, compelling Mott to resign in 1868. 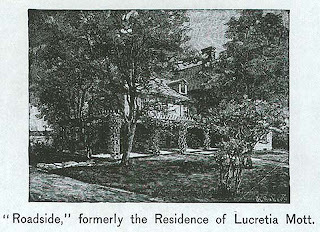 Lucretia Mott died at her home “Roadside” in Cheltenham outside of Philadelphia in 1880 after a long successful career as a significant abolitionist and women’s rights leader.